Normally one would imagine that the betting markets should usually be the most accurate predictor in terms of the probable outcomes of events such as elections given that there is nothing that focuses ones mind more then putting ones own money where ones mouth is, which clearly the pollsters NEVER do given that they tend to be consistently wrong AND tend to publish polls that range all over the place so that after the fact can point to an outlier poll to imply that they got the election result right when in reality they most definitely got it very badly wrong! However, the bookies and betting markets have been just as wrong as the pollsters for several major elections from the Sept 2014 Scottish Independence Referendum, to the UK 2015 General Election to the 2016 EU Referendum, and of course were badly wrong on Trump! The obvious reason why the bookies have also been getting elections wrong is that the betting markets are heavily influenced by the pollsters. 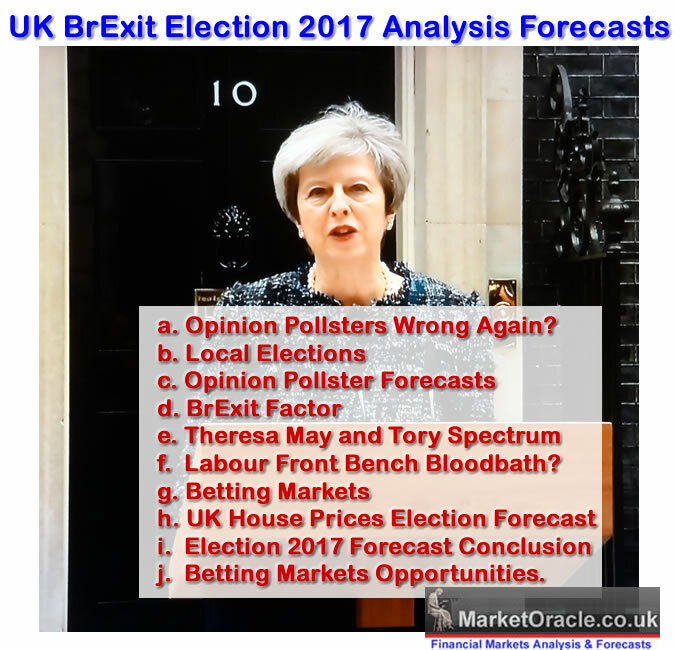 So in my latest analysis in this BrExit General Election series I will take a look at what the betting markets are saying in terms of the most probable election outcome given that the polls are literally gyrating all over the place. Ensure you are subscribed to my always free newsletter for my imminent seats per party forecast conclusion, which normally I would have normally completed a couple of months earlier were it not for this election being called without any warning, snap general election. 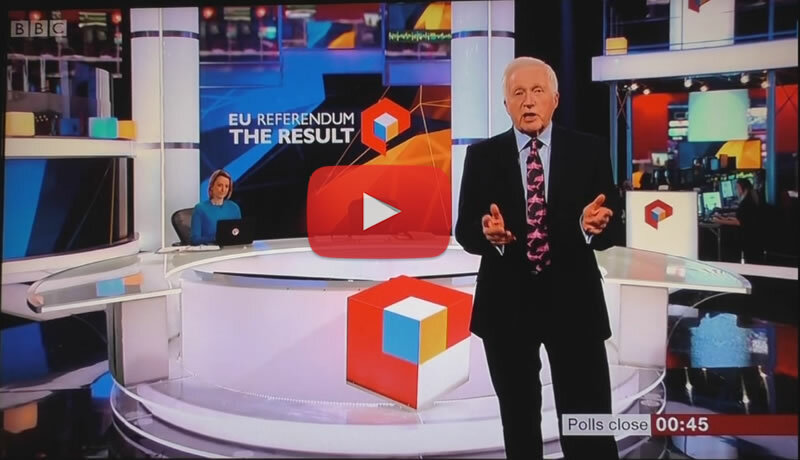 Firstly here's a clip from the 2016 EU Referendum BBC coverage that plays from showing the betting markets had REMAIN winning with LEAVE odds as high as 14-1, which would convert a £100 bet on LEAVE into a £1300 profit! Now before I get to what the betting markets are saying for this general election you need to understand one fundamental point, which is that as a market trader (including betting markets) I WANT THE BETTING MARKETS TO BE WRONG! I WANT THEM TO BE JUST AS CLUELESS AS THEY WERE FOR THE EU REFERENDUM AND THE US PRESIDENTIAL ELECTION. For if they are wrong then that presents for massive profit potentials in terms of risk vs reward. 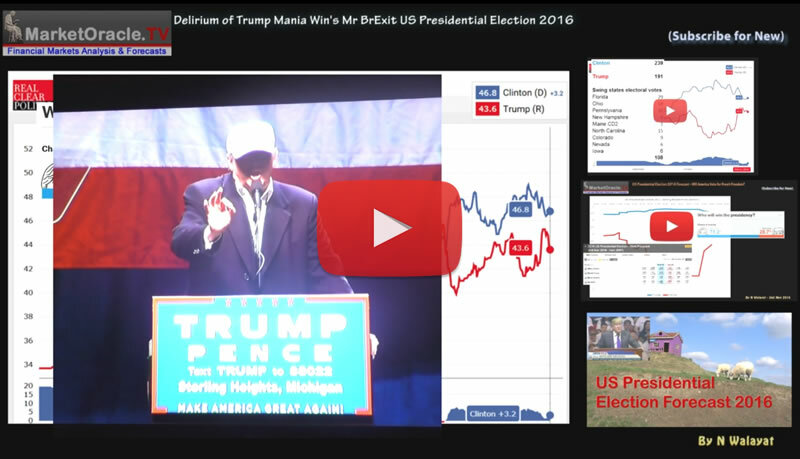 For example 1 hour after the polls closed on the 8th of November 2016 Donald Trump was trading at a price of 12 which translates into a £100 bet converting into a £1,100 profit! Against a £100 bet for Hillary converting into just a £10 profit! And barely 2 hours later the positions completely flipped as the price at 3am had Trump in a clear lead on 1.69 to Hillary on 2.4 thus finally converging with my long standing forecast that TRUMP would WIN the election. Therefore in this analysis I am not just looking for what he Bookies are stating is the most probable but whether there are any opportunities for huge risk vs reward scenarios, as has been the case since every major election since 2015. According the spread betting markets such as IG Index the Tories peaked in early May on 404 seats, and now have fallen to 368 seats. And if the downwards trend trajectory continues then would target 359 seats by June 8th. So the spread betting markets are forecasting a Conservative election win on an increased majority of about 68. Whilst the spread markets have the SNP trading on 47.5 seats and Lib Dems on 12. The betfair market clearly very strong favours a Conservative election victory trading on just 1.23. Whilst Labour is trading on 24, where if a Labour win was possible would present a huge profit potential! In terms of the number of seats, the Betfair market favours 350 to 399 seats for the Tories, which could offer some profit potential given the spread betters are trading near the mid way point of 370 seats. Whilst Labour is trading on a above or below 200 knife edge. The overall impression is that the betting markets are targeting a forecast Conservative total of between 355 - 375 seats. And Labour on between 190 and 210 seats. Thus strongly implying that Theresa May will win the election with an increased majority of between 60 and 100 seats which is contrary to recent polls such as by YouGov.